You can’t also believe what you see with photographs, especially these days with Photoshop. But even way before Photoshop, images were edited to fit the needs of those in the photo or to make those looking at the photo believe in something other than the truth. Fourteen-year-old Mary Ann Vecchio kneels over the body of Jeffrey Miller, a student at the university who was killed by National Guardsmen during a protest against the war in Vietnam. This Pulitzer Prize–winning photograph, taken by photojournalism student John Filo, became an icon of the tumultuous period. The photo violated one of the cardinal rules of photographic composition: the fence post in the field behind Vecchio terminates at the top of her head, almost as if a giant nail has fallen into her skull. 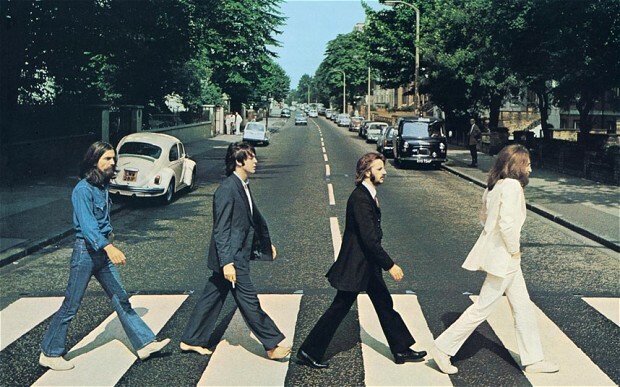 When the image was published in Life magazine that week, the editors opted to remove it. 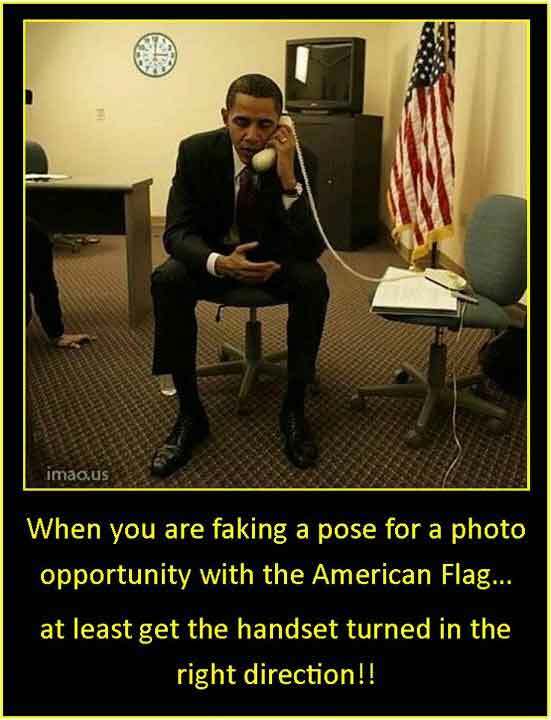 This widely circulated image supposedly shows US President Barack Obama posing for a photograph while holding a phone handset o his ear upside down. The image, along with several derogatory descriptions of the depicted incident, has circulated via email, blogs and social media outlets since 2008. However, the image is a hoax. In fact, it is a digitally altered version of the following original photograph which shows President Obama holding the phone correctly. Many observers would quickly recognize the digitally altered version as just a political joke or visual political commentary. Nevertheless, submissions and comments indicate that there are also many people who believe that the hoax image is genuine. The Israeli newspaper Yated Neeman published this version of a group photo of Netanyahu, the country’s newly elected Prime Minister, front left, with President Shimon Peres, front right, and members of Netanyahu’s new government. 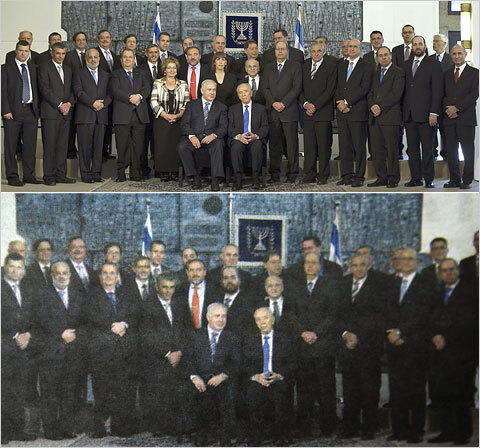 An unaltered version of the photo reveals that the newspaper has replaced the two female Cabinet members, Limor Livnat and Sofa Landver, with men’s faces. The faces belong to ministers Ariel Atias and Moshe Kachlon, who in the original photograph can be seen toward the periphery of the group (standing, second from left and second from right). In Yated Neeman‘s version of the image, they have been cropped out. Much of the newspaper’s readership consists of ultra-Orthodox readers who do not think it proper for women to serve in the government. 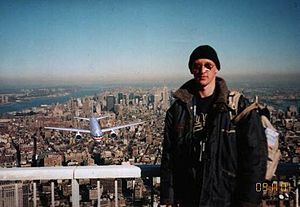 The “tourist guy” was an Internet phenomenon that featured a fake photograph of a tourist who appeared in many manipulated pictures after the September 11, 2001 attacks. Shortly after 9/11, an image surfaced on the internet, purportedly from a camera found in the debris of the World Trade Center. The image showed a man, dressed in a wool cap, heavy jacket, and backpack, standing on the observation deck of the World Trade Center. Below him, a jet plane can be seen flying towards the building. Because of its closeness and low altitude, it seems certain to collide with the tower. It was proven to have been taken in 1997. The original version of this photo was taken in 2002 when President Bush was visiting a school in Houston. AP distributed the photo. Then an altered version of the photo hit the internet. 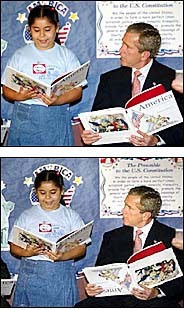 In this one it appears that Bush is holding the book upside down. A hoaxer was horizontally and vertically flipped the book around. But they made a mistake, if you compare the books, the right side of Bush’s book has been vertically flipped in the wrong direction. It was also widely rumored that the morning of 911 when President Bush heard about the terror attack while reading to school kids that he held the book ‘My Pet Goat’ upside down. Firstly the children were reading to him and secondly there is no photographic or video proof of the book being upside down. The photo, reportedly taken on March 2013 was released by North Korean Central News Agency. 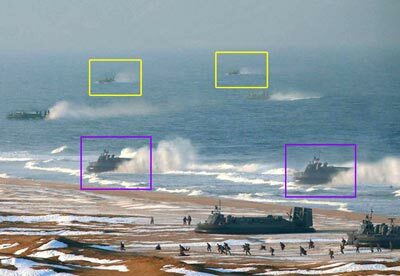 Analysts say two hovercrafts towards the bottom of the image are actually just two that have been copied. The same allegation has been made against two more at the top of the picture. AFP/Getty, who had distributed the photo issued a ‘mandatory kill” of the photo. This is not the first time North Korea has been caught in the act of altering photos. One of the most widely reproduced scenes of the Russian Revolution, this photograph was taken by G.P. Goldshtein and was published in myriad forms during the Soviet era. 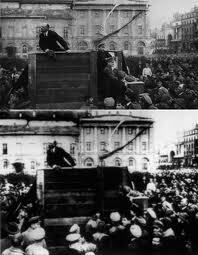 On May 5th, 1920 Lenin gave a famous speech to a crowd of Soviet troops in Sverdlov Square, Moscow. In the foreground was Leon Trotsky and Lev Kamenev. The photo was later altered and both were removed by censors. Taken within seconds of the preceding photo, this frame reveals that Lenin was joined that day by fellow Central Committee members Leon Trotsky, who stands in hat and mustache on the stairs to the right of the podium, and Lev Kamenev, who stands behind him. Perceived by Stalin as rivals to his power, both men were ultimately purged and their contributions to the revolution largely eliminated from the historical record. Though the photograph was widely published with the two men present during the 1920s, it was reproduced with stairs in their place for most of the Soviet era, even during the Gorbachev period. The Nazi filmmaker Leni Reifenstahl was visited by the Führer in Berlin. To her left is her brother and on the far right is his wife. There is a missing figure next to Hitler which was actually that of Joseph Goebbels, the Third Reich’s top propagandist and one of the architects of the Holocaust. It remains a mystery why Hitler had his loyal colleague erased from this photo. One of the most famous pictures of President Abraham Lincoln was in fact altered. Lincoln’s head was placed atop South Carolina politician John Calhoun’s body in this 1860 photo. 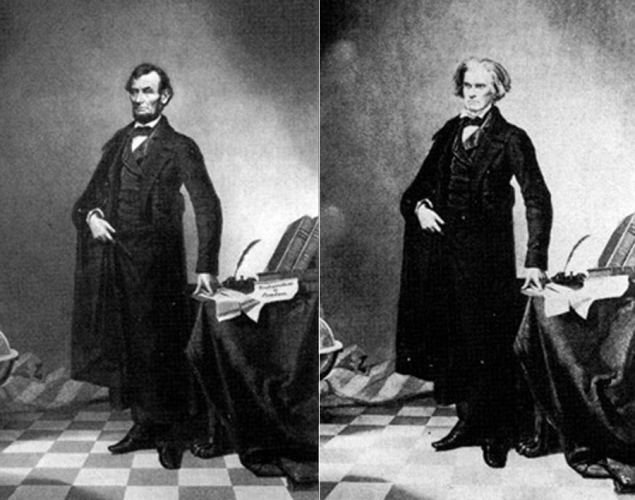 Interestingly enough, Calhoun died in 1850.The 1860 portrait, stitched together from two pictures could be the first ever Photoshopped image. Did they also put that smirk on Bush’s face after 9/11?